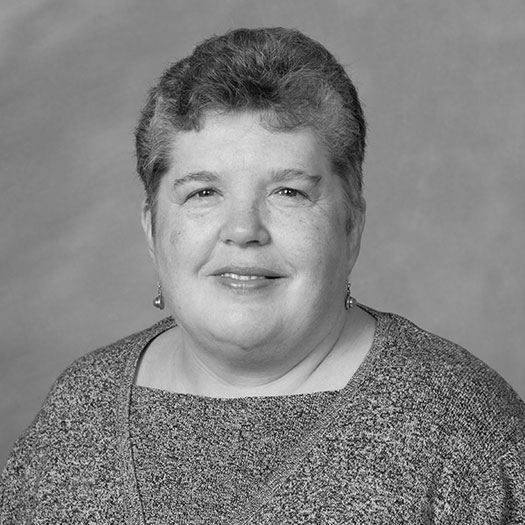 When Jessica Vogel (’08) enrolled at Wake Forest in 2004 her plan was to pursue a career in anthropology. But as often happens with plans, hers changed when she received a Presidential Scholarship in art. The scholarship, along with personal attention from art department faculty, gave her the recognition and confidence she needed to move forward as an artist. Mentors helped her refine a point of view and introduced her to the connection between art and entrepreneurship. “It was an interesting liberal arts education that was open to experimentation,” says Vogel, a sculptor in Massachusetts who was recently named one of “Six to Watch” by The Boston Globe. While at Wake Forest one of her public art projects was to create artistically themed backpacks that drew attention to national issues such as stem-cell research or immigration. In addition, Vogel and fellow student Bill Brown received a grant from the Chambers Family Endowment Fund for Entrepreneurship to support an art/business venture, Stuffed Robot Inc., marketing handmade stuffed toy robots. 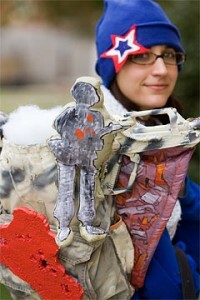 Jessica Vogel, as a senior, wearing a backpack on the war in Iraq she created as part of a public art project. Last May she received an MFA from Massachusetts College of Art and Design with a focus in three-dimensional art and sculpture. Her artistic vision combines fantasy and reality, and she draws visual cues from such places as science fiction films and movie musicals from the ’50s. 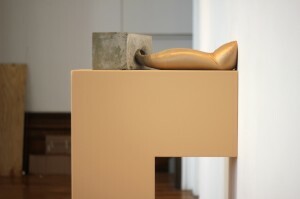 Vogel says her work has an underlying theme of dualism, whether it’s in the pairing of two forms or the combination of two contradictory feelings. An assistant preparatory working in exhibitions at the Bakalar and Pain Gallery of the Massachusetts College of Art and Design in Boston, this summer she’s spending a month as an assistant preparatory at the Solomon Guggenheim Museum in New York; she’ll also have two showings of her work in Boston.